Ah! 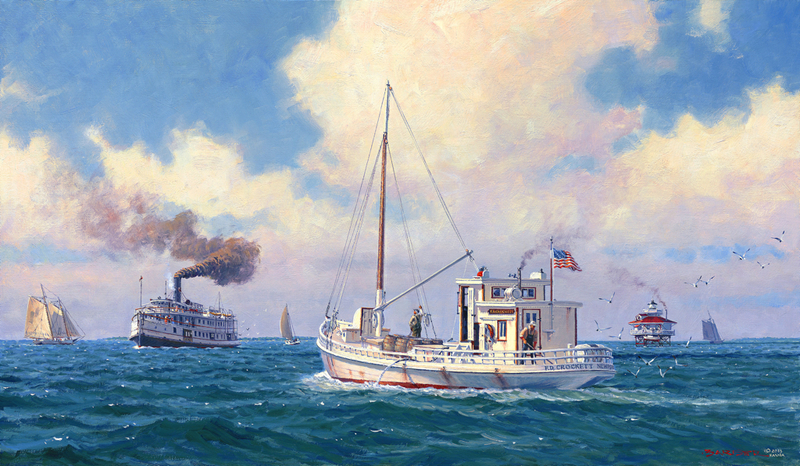 The age of sail and steam on the Chesapeake – glorious times! 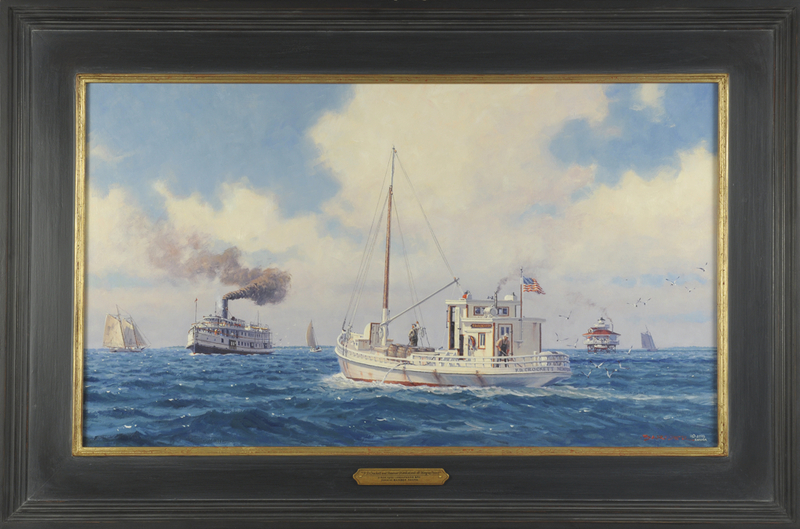 On this bright summer morning we see the motor vessel F. D. Crockett and the passenger steamer Piankatank approaching one another off Stingray Point at the mouth of the Rappahannock River. In the early 1930s the Crockett ran cargo and freight around the Bay and the Piankatank ferried passengers from Baltimore to landings on the Bay and its rivers. Vessels such as schooners, skipjacks and bugeye ketches worked local waters under clouds of sail. The hexagonal lighthouse marks Stingray Point at the southern mouth of the Rappahannock River in the Chesapeake just offshore from Deltaville, Virginia. The light was built in 1859 and dismantled in 1965. F.D. Crockett was built in 1924 for Ferdinand Desota Crockett of Seaford, Virginia and is now owned by the Deltaville Maritime Museum. Citizens interested in the maritime heritage of the area established the Museum in 2003. As with all originals purchased directly from me, this piece comes with a handsome “House of Troy” painting light attached complimentary. [$60 value]. In addition, a gilded and hand lettered nameplate.